A total of 59 brands from the UAE received the Superbrands status at the 14th annual tribute event, organised by Superbrands, the independent authority and arbiter of branding at the Intercontinental Hotel in Dubai Festival City. 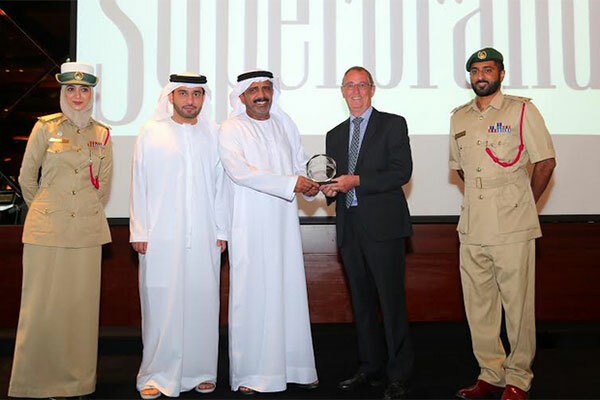 Superbrands recognized the Dubai Police for its efforts in exceeding the standards set in its brand mission statement over many decades and the Apparel Group for its ‘Distinguished Services to Retail Branding’. Maj Gen Mohammad Saeed Al Marri, assistant commander for Society Happiness & Equipments, Dubai Police and Neeraj Tekchandani, Group chief financial officer of Apparel Group received the special recognitions. The 2018 Superbrands book was unveiled at the event, also dubbed the ‘Oscars of Branding’, where the UAE’s strongest brands were honoured. “Built on five pillars - transparency, cooperation, justice, professionalism and team spirit - Dubai Police has strived to offer its citizens and residents the highest level of security a safety despite the presence of many different nationalities and cultures,” said Mike English, director, Superbrands Middle East. “We are thrilled to announce that the Apparel Group has being recognized for its outstanding commitment and achievements to great customer service and experiences in the retail space. In an era of virtually limitless choice, sustained competitive advantage only comes to retailers who engage customers differently – by truly understanding who they are, what they want and why they buy,” English continued. Established in 1999, the Apparel Group is a global fashion and lifestyle brand conglomerate with a strong presence not only in the UAE, Kuwait, Qatar, Bahrain, Oman, and Saudi Arabia but has also opened thriving gateways to market in India, South Africa, Poland, Singapore, Jordan, Indonesia, Thailand and Malaysia. With over 2,000 leading brands in the UAE vying for the coveted Superbrands title, only 59 scored more than 80 per cent of the total possible mark and were declared Superbrands by the Brand Council. Winning this accolade is a powerful endorsement and evidence for existing customers, potential customers, the media, suppliers, investors and employees of each brand’s exceptional status. This year, Superbrands were voted not only by the brand council but also by online voting, which has expanded the voting base to almost 2,000 senior managers and marketing professionals. The Superbrands programme acknowledges and rewards the highest standards of branding. Over the years, the Superbrands organisation has achieved international acclaim for being the independent authority and arbiter of branding excellence. The organisation is committed to the cause of promoting exceptional brands and the discipline of branding in the region. The 2018 Superbrands book is a coffee table book, which includes a two-page profile of each Superbrand tracing the foundation and development of the brand and a ‘Things You Didn’t Know section’ highlighting interesting facts about the brand and its unique achievements was also unveiled at the Tribute Event.